Google combines two key traits to make it a "must own" for any investor. Of the thousands of stocks one can invest in, there are only a handful that you can reliably invest in and plan to hold for life. Google (NASDAQ:GOOGL) is one of those companies. The world's largest search engine has the coveted one-two punch: a sustainable edge over the competition, and culture of innovation. The makes Google stock as close to a "must own" as you can find. Who doesn't use the Big G? To appreciate what the company has been able to accomplish over a relatively short period of time, take a look at how Google has wrested global market share for search from Yahoo! and Microsoft's MSN Search, Windows Live Search, and now Bing -- all while holding Chinese search giant Baidu at bay. Sources: Netmarketshare, Market Watch, webpronews, clickz, OneStat, and Websidestory. Google has lost some ground internationally because of its decision to back out of China, where Baidu now dominates. Overall, however, its global market share is 12 times larger than the next competitor, Yahoo! That type of dominance is important for two key reasons. First, it means that Google is collecting more information on more users -- by an enormous margin -- every day. Google can turn that information around and ensure that users get a search experience tailored to their personal desires. Just as important, because Google has all of this information, it is able to offer advertisers the most efficient use for placement of their Internet advertisements. Because Google is the only entity that has all of this information, businesses are more than willing to pay for Google's AdSense services. If Google were content to be King of Search, it would still make a good investment. But it's the fact that CEO and co-founder Larry Page keeps pushing the company to become more that makes Google a great investment. Google has a well-documented 20% time policy. It allows employees to spend 20% of their work time on any Google-related project that they like -- and doesn't need to be directly related to their day-to-day duties. This innovative time has unleased a plethora of products for the company: Gmail, Google Maps, and Chrome, to name a few. That's why you shouldn't be surprised to hear about Google developing Google Glass, or self-driving automobiles. Some of these projects may turn out to be duds, but that's not the point. The point is that Google will continue to drive innovation. If only one of every 10 ideas makes it to market and is a hit, then Google -- and its shareholders -- are the big winners. The price tag for Google stock could rightly scare away some investors: about $900 per share! But if you dig a little deeper, you'd see that Google investors have always been rewarded for their faith in the company. And on a price-to-earnings basis, Google is actually cheaper now than it historically has been. GOOG Total Return Price data by YCharts. 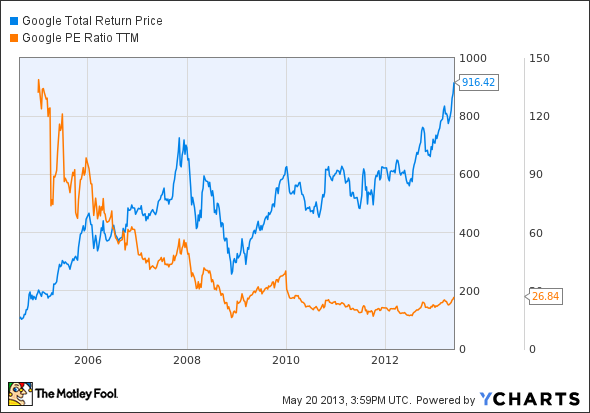 Google has played a key role in helping my retirement portfolio outperform the S&P 500. Since mid-2011, the stock has beaten the market by 54 percentage points. Google stock currently accounts for about 9% of my real-life holdings, and I plan on continuing to hold it in my retirement portfolio indefinitely.